1. The reformulation of Polyurea’s for the residential market has made a positive impact on the garage floor coating industry. These durable coatings have been used in heavy duty commercial applications for years. As the popularity of the residential market has increased, manufactures have reformulated these coatings to be applied without the use of specialized spray equipment, and can now be used for garage floors, garage flooring, epoxy garage floors, garage floor coatings. 2. The claims that you read on the internet about how they are 3-4x more durable than epoxy is true. It is their flexibility that makes them stronger. Epoxy is more brittle. 3. The problem with Polyurea is that is simply does not stick to the garage floor as well as good ‘ole epoxy. It dries significantly more quickly and thus does not have the opportunity to wick into the pores of the garage floor concrete as much as epoxy does. This causes a weaker mechanical bond to the garage floor concrete surface and reduces the total Moisture Vapor Emissions it can resist. 4. A 100% polyurea floors only makes sense if time is of the essence. A manufacturing plant that simply can not afford to be down for 2-3 days for example. Polyaspartics are also much more expensive, but they do have there place. 5. We use polyaspartic polyurea often, but 98% of the time as a top clear coat on a garage floor only. The fact is, you can get the best of both worlds by using epoxy flooring as your base coat and polyurea as your top coat. You get a final garage floor coating that will stick to the floor through high moisture vapor emissions, and the increased durability of a polyurea top coat. Why use expensive polyurea as your base coat if you don’t have to….just use it where it counts, on the top. 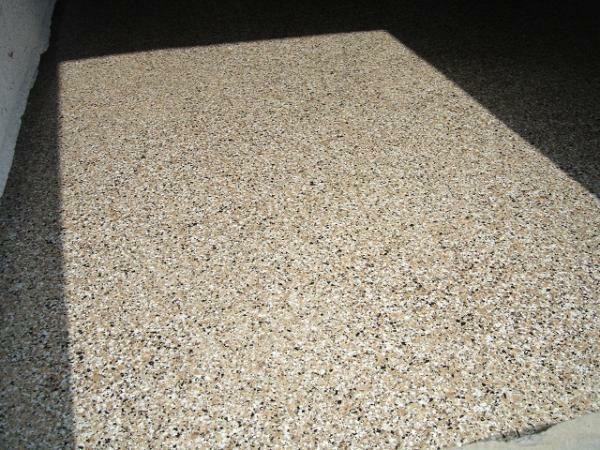 You end up with a better garage floor at a lower cost.